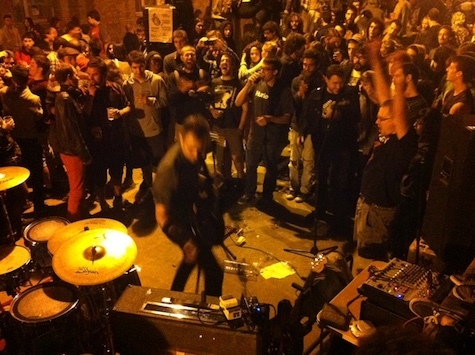 Ted Leo does a street show. The photo is from his Kickstarter page. Read the whole article here and contribute in Leo’s Kickstarter from here (I know I will because, well, I love Ted Leo). I’ve been asked by local artists what I think of Kickstarter. It’s a great way to presale your record, especially if you intend to press vinyl. At the very least it’ll give you an idea regarding how much demand there is for actually releasing your music on vinyl. If you can’t hit your goal, you may want to rethink your strategy. Vinyl is pricey. Leo’s goal is a whopping $85,000. He just went online with his Kickstarter and he’s already at the $50,000 mark. No doubt he’ll hit his goal, after which the pressure’s on to get the record out. He doesn’t want to be in the same situation that Matthew Sweet found himself, having conducted a Kickstarter in the summer of 2014 that he’s yet to make good at (though he promises the record will be out in late spring). Another local artist brought Pledge Music to my attention. According to the website Pledge Music is “dedicated to empowering artists, labels and brands to build communities, fund and pre-sell recordings, and provide unique experiences and exclusives throughout the entire music production and promotion lifecycle.” Pledge is truly music-focused (unlike Kickstarter which is wide open to any offer), and is more of a pre-sale website with some monster users, including Willie Nelson and Weird Al and Nelly Furtado. Has anyone locally tried Pledge? Tonight Philly/Denver electronic band Lotus plays at The Slowdown. I only included this show announcement because the Slowdown’s description says, “The tightly produced yet raw grooves recall sounds of The Talking Heads, Jamiroquai, and LCD Soundsystem.” Really? JackLNDN opens. $25, 9 p.m.